This article will go over how I used the view creators and view composers in Laravel to create a decoupled navigation system. To explain the context a bit, I'm building re-useable parts of an application, to give me the ability to quickly create an administration interface for clients. To achieve this I'm using the Pingpong/Modules package. You can go over the modules I'm building over at my dedicated organisation on github. The basic difference between a View Creator and a View Composer is when it's called. A View Creator is called directly when the view is instantiated. Compared to a View Composer, is called when the view is rendered. We can take adventage of this fact to create menu items using Laravals Collection class. The goal was to give the ability to each module to send what navigation items it needs to a 'Core' module. This way to core module doens't care about what other modules there are. 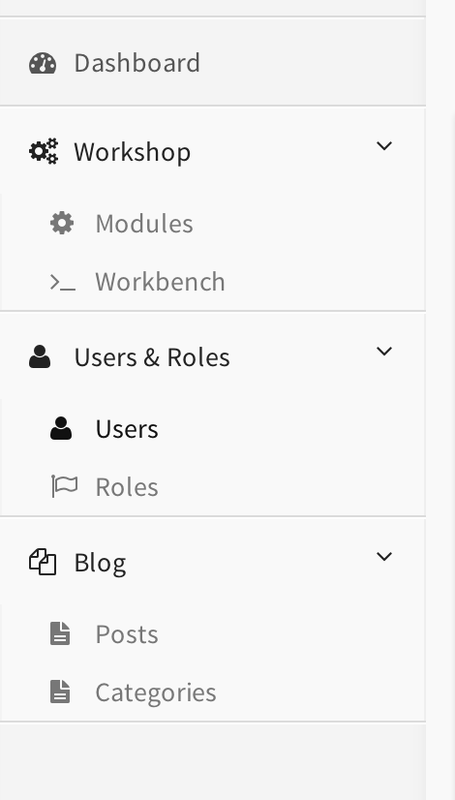 As you can see there are currently a Dashboard, Workshop, Users & Roles, Blog module. So how did I do it? I used one View Creator and each module has its View Composer. The navigation is a Laravel Collection, with sub-collection if the module needs sub-lists. The View creator lives in the Core Module, and basically just initialises the collection. This View Creator and the other View Composers are all attached to the navigation.blade partial view. The weight key is the one that'll be used to sort my menu. As you can see, this View Composer just puts an item in the previously created Laravel Collection. In this case I use the first item of the sub Collection to set its weight. Now when every module is done sending its navigation item(s) to the Core module, I send the items to a Navigation Ordener which will re-order the menu items based on its defined weight key. And as a final step, I loop over every item in the view to display it. And voilà. Now every module can independently send its navigation and it'll be display as it should, in the correct order.